If you want to buy or send flowers that will stand the test of time, then these high-quality silk blooms are just for you! Made from durable silk with some plastic and foam elements, these hydrangeas will last that much longer. Many people wonder just how effective artificial flowers really are. The key is to choose flowers that look as realistic as possible. Which is why we have arranged these fine silk flowers in a glass vase with pebbles and resin. The realistic-looking water gives the entire silk arrangement a more credible appearance. Perfect for all occasions and all recipients – this gift will stand the test of time! 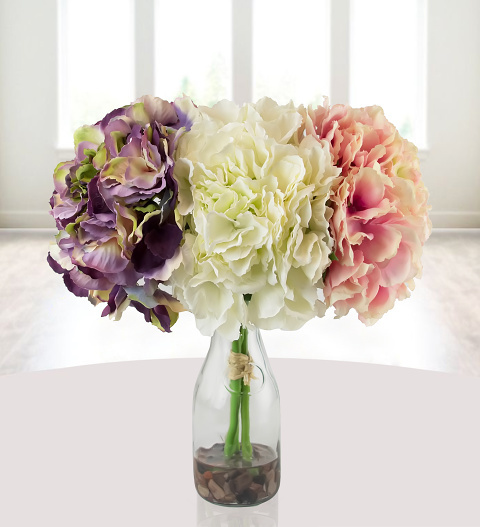 Included are 3 luxury hydrangea steams presented in a glass vase with resin and pebbles.